We’d love your help. Let us know what’s wrong with this preview of Eliza Hamilton by Tilar J. Mazzeo. 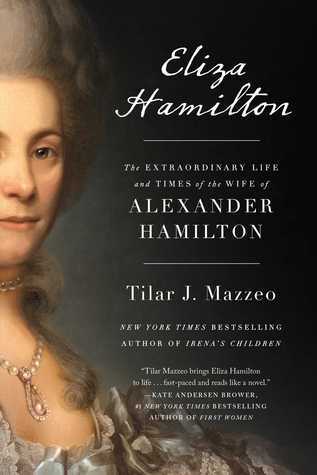 Fans fell in love with Eliza Hamilton—Alexander Hamilton’s devoted wife—in Lin-Manuel Miranda’s phenomenal musi From the New York Times bestselling author of Irena’s Children comes a comprehensive and riveting biography of the extraordinary life and times of Eliza Hamilton, the wife of founding father Alexander Hamilton, and a powerful, unsung hero in America’s early days. To ask other readers questions about Eliza Hamilton, please sign up. Why is there a picture of a lady who isn't Eliza Hamilton on the cover? Collette Gee That should be a warning for how awful and historically inaccurate this book is! Eliza deserves so much better! Reading this was an absolute waste of time & I do not understand how the term "biography" can be attached to this. Biographical fiction? Yes. But this is not a biography. The way the author wrote this was incredibly frustrating, starting with the first sentence on the first page: "Eliza blushed. It was a beautiful letter." After reading the first page, I actually checked to make sure this was a biography and not another fictional account of her life. The rest of the book continued this way, Reading this was an absolute waste of time & I do not understand how the term "biography" can be attached to this. Biographical fiction? Yes. But this is not a biography. The way the author wrote this was incredibly frustrating, starting with the first sentence on the first page: "Eliza blushed. It was a beautiful letter." After reading the first page, I actually checked to make sure this was a biography and not another fictional account of her life. The rest of the book continued this way, with the author filling in holes with her own ideas of what Eliza would have said or done in a situation, based on what little we know of her. There aren't a lot of primary source documents authored by Eliza, so most of what the author relies on are other peoples REACTIONS to her letters & actions. Yes, you can make inferences from that, but the fact is that since we don't have letters or diaries from Eliza for the bulk of her life, most of what is written here is sappy conjecture. The theory about the Maria Reynolds scandal was also a bit over the top. (view spoiler)[The author believes the idea that there was no actual affair, and that the Reynolds Pamphlet was just a cover up for Hamilton's shady financial dealings, and that Eliza went along with the deceit to protect the male members of her family from debtors prison. (hide spoiler)] Is that theory true? Maybe. But in making this theory look better, she deliberately left out information about Maria Reynolds that other historians have included in their telling of these events: like the affidavit from the son of Maria's first land lady in Philadelphia, attesting to her wild mood swings & that she would "insinuate herself on certain high & influential characters". In his statement he also stated that the Reynolds' slept in separate beds when they moved to new lodgings, and that "gentlemen left letters in her entryway" and "at night she would fly off as supposed to answer their contents". She also fails to mention that Maria Reynolds went on to marry Jacob Clingman (before her divorce was finalized), who was a friend of James Reynolds, and was arrested with him. But none of this is ever mentioned. She gives the Hamilton Musical version of the affair, and then spends a good chunk of the book giving validation to her theory. "Aaron Burr was famously louche and horny." What can I say about a sentence combining a high school senior's vocabulary word with slang? Not to mention "a hot bullet tore through Hamilton's abdomen, shattering his rib cage." Nothing actually wrong with either one, except that I found sentence structures like this gave me pause on almost every page. And then the lines such as: "Those words echoed for Hamilton, who lay very still until he heard the quiet breath of his child sleeping." There is no "Aaron Burr was famously louche and horny." What can I say about a sentence combining a high school senior's vocabulary word with slang? Not to mention "a hot bullet tore through Hamilton's abdomen, shattering his rib cage." Nothing actually wrong with either one, except that I found sentence structures like this gave me pause on almost every page. And then the lines such as: "Those words echoed for Hamilton, who lay very still until he heard the quiet breath of his child sleeping." There is no reference for this interjection of interior thoughts and invisible actions and motivations, because it is pure guesswork. The author does this often, beginning with the first line of the book. Lots of marginally relevant research cited in direct quotations from letters, but then even more pure conjecture that is not at all believable. I wish, if she had actually wanted to write a novelized version of Eliza Hamilton's life, she had not pretended to be writing history. I wish she had made up her mind to tell what is known or at least make up a better story—instead of pretending she could do both at the same time. By the end I did not like any member of this family. Putting it kindly, Hamilton was a rogue and his wife was a doormat. As one example, Hamilton may have forged letters supposedly written to him by a married woman in order to avoid being prosecuted for financial impropriety. Or maybe, when he publicly confessed the affair, he was not destroying an innocent married woman's life, but telling the truth and only ruining Eliza's life. He left her $50,000 in debt, in part because he always had her living at some distance from the city where he worked and maybe was having affairs. He praised his wife in letters, promised for all the years of his marriage that they would be together and they rarely were, though he did manage to keep her pregnant. Perhaps it was Hamilton who was "famously louche and horny." He also bought slaves, and admitted to marrying Eliza for her money, though he did find her biddable and "handsome" but not beautiful. Somehow she managed her family's accounts for years but was completely ignorant of debt or her husband's sexual, political, and money troubles? Why don't I believe it? What was he thinking? Few of the rich men or wanna-be rich men of his era bear close scrutiny. This was supposed to be Eliza's story, but the 50 years she lived after her husband's death are covered in a snap. I was kind of disgusted by the end of it. success makes me question the timing and perhaps the author's motivation in writing the book. Eliza Hamilton was an intriguing personality in history and deserves a proper biography. So interesting! A great look into her life. I loved this super readable biography of Eliza Hamilton. For anyone who can't get enough of the Hamilton craze, or just wants to learn more about a strong woman coming of age with America, this is a great read. My one caveat is that it's told in such a wonderfully readable style (it's not dry at all), that I was a little uncomfortable with the author authoritatively saying what Eliza's reactions to events, etc were. I wish there was more source material from Eliza herself. However, there's just s I loved this super readable biography of Eliza Hamilton. For anyone who can't get enough of the Hamilton craze, or just wants to learn more about a strong woman coming of age with America, this is a great read. This was an intriguing glimpse into the lives of Eliza Hamilton and her Revolutionary peers. I’m glad that while this is a biography of Eliza there was a plethora of information about the people who influenced her life and times. I’ve seen plenty about Eliza’s relationship with her husband and sisters, but this book gave me a much more complete picture of her life. I was fascinated by the historic figures she interacted with as well as her unique part of establishing the United States of America This was an intriguing glimpse into the lives of Eliza Hamilton and her Revolutionary peers. I’m glad that while this is a biography of Eliza there was a plethora of information about the people who influenced her life and times. I’ve seen plenty about Eliza’s relationship with her husband and sisters, but this book gave me a much more complete picture of her life. I was fascinated by the historic figures she interacted with as well as her unique part of establishing the United States of America. I highly recommend this biography to American history enthusiasts as well as fans of Hamilton. My husband and I recently saw the musical Hamilton, and like many people who have that pleasure, I was curious to know more about Alexander Hamilton and his wife Eliza. This was a good biography, and I understand it is the ONLY complete biography of Eliza Hamilton. It gave me the information I wanted and was written in a very readable, novelistic form. 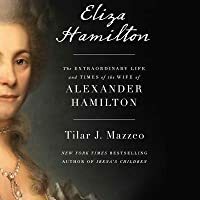 In several places, Mazzeo assumes that she knows what someone was thinking, which is a little jarring in a serious biography, but in almost every My husband and I recently saw the musical Hamilton, and like many people who have that pleasure, I was curious to know more about Alexander Hamilton and his wife Eliza. This was a good biography, and I understand it is the ONLY complete biography of Eliza Hamilton. It gave me the information I wanted and was written in a very readable, novelistic form. In several places, Mazzeo assumes that she knows what someone was thinking, which is a little jarring in a serious biography, but in almost every case, I felt that the author’s assumptions about her subject’s feelings or thinking were well-researched and probably accurate. It was obvious that Mazzeo not only did research to dig out the facts about Mrs. Hamilton; she also made an attempt to get deep into Eliza’s head, which made the book more interesting to me – and which leads her to a contrarian view of the Reynolds affair. The early American setting is also very well-done. We get a sense for the dangerous frontier that New York state still was early in Eliza’s life, and for the social mores of upper-class life in the early years of our nation’s history. Eliza endures her share of heartbreak and hardship, as well, which made her sympathetic and admirable character. The author states that she is not a historian; this is the truest thing she's written in the entire book. I've spent the last year or so doing an in-depth survey of Alexander Hamilton's life, times, and legacy, and along the way, I've also learned quite a bit about Eliza and the Schuyler family (even visiting their homes in Albany & Saratoga). I don't expect every book I read to be a doctorate-level dissertation, but this... this was some really BAD history. For one thing, the author couldn't The author states that she is not a historian; this is the truest thing she's written in the entire book. For one thing, the author couldn't seem to decide if she was writing a novel or a biography. With a novel, you can place your characters in imagined situations and give them pretty words to say. If you're writing non-fiction, it's best to stay away from flights of fancy unless you have historical evidence to back it up with. Mazzeo is woefully lacking in her evidence--I'll come back to this!--and gives as fact situations that did not exist. When the book's prelude opens with a description of Eliza's thoughts & feelings as she reads a letter from her fiance, I hoped that it was just a fanciful re-imagination that would give way to an actual historical account, but unfortunately, the entire book was written this way. Too much emphasis on sweaty palms and heaving breasts, not nearly enough on verifiable facts! What historical accounts do make their way into the text are often wildly misconstrued. Mazzeo clearly empathizes with Eliza, to the detriment of all those around her. Angelica & Alexander certainly come off badly, but the author even casts TENCH TILGHMAN as a rake, based on her interpretation of a few vague lines in his memoirs (I've searched for further proof of his womanizing and come up empty-handed). The most absurd part of all is when Mazzeo repeats claims that Hamilton wrote the 'Reynolds Pamphlet' (his confession to an extra-marital affair) to cover up for the fact that he was embezzling money from the government for his in-laws! This is based on the scurrilous accusations of 18th C. partisan journalists and one historian, Julian P. Boyd, from the mid-20th C. Not only were there several investigations into the Treasury Secretary's records both during AND after his tenure--none of which turned up a single shred of evidence--but Hamilton & Philip Schuyler both died more-or-less insolvent. The author's greatest sins of all, IMHO, are in her footnotes & bibliography. Many of her sources are not historical documents at all, but articles off of websites. THE INTERNET IS NOT A PRIMARY SOURCE, FOLKS. Some of her more spurious claims can be traced to faulty or biased material (including the single worst book I've read on Hamilton, Tucker's 'Alexander Hamilton's Revolution.' If an author cannot spell your subject's name correctly--Tucker's book refers to 'Elizabeth Schuler Hamilton' at one point--maybe you shouldn't rely on his information?). When she *does* refer to primary documents, Mazzeo makes some major errors. In one instance, she mixes up & mis-attributes several letters by John Adams; Adams notoriously slandered Hamilton after his death, but where Mazzeo points to his letters with Dr Benjamin Rush, most of the information she quotes came from a letter TO Adams, where the writer is *refuting* the claims of serial adultery on Hamilton's part. The subject of this book, Eliza Hamilton, is always worthy of five stars. Unfortunately, before I read this book, I read 'My Dear Hamilton', which presented the same facts, in a more fiction aspect. So, I felt like I was reading a less thrilling version of that. It's not to say that it's not good, and that I'm not grateful. It's a good read for anyone who wants to learn the facts of Eliza's life- without the pretense of fiction distorting fact from filler. The qualm I have with this read is that The subject of this book, Eliza Hamilton, is always worthy of five stars. Unfortunately, before I read this book, I read 'My Dear Hamilton', which presented the same facts, in a more fiction aspect. So, I felt like I was reading a less thrilling version of that. It's not to say that it's not good, and that I'm not grateful. It's a good read for anyone who wants to learn the facts of Eliza's life- without the pretense of fiction distorting fact from filler. This review has been hidden because it contains spoilers. To view it, click here. This book is not a biography and the author is simply trying to capitalize on the success of the musical Hamilton. If naming chapters “and Peggy” and “Winter’s Ball” was not evidence enough, the very first line of the Author’s Note quotes the musical as well. At best, this book is an historical fiction, and not a very enjoyable one. I started the book with the expectation of a biography. This delusion was quickly shattered as the book is peppered with expressions like “Eliza smiled” or “Eliza si This book is not a biography and the author is simply trying to capitalize on the success of the musical Hamilton. If naming chapters “and Peggy” and “Winter’s Ball” was not evidence enough, the very first line of the Author’s Note quotes the musical as well. Finally, the author’s position on the Reynolds’s affair and subsequent scandal has very little basis in reality. The author assumes that the affair was a cover up for speculating on the part of Alexander and that Eliza knew about all of it the entire time. This seems far fetched and is countered in an actual biography, Hamilton by Ron Chernow- the book upon which the musical is based instead of the other way around. Chernow’s book also only dedicates a few pages at the end to Eliza’s life after Hamilton, but even those few pages are of more substance than the entirety of this book. I would recommend that you don’t waste your time or money. And why does it read like a novel? Because that’s what it IS! Just how, pray tell, does Mazzeo know how Hamilton thought, acted, or felt? How does Mazzeo constantly know Hamilton’s emotional state, or what she did down to the last minute of every waking day? Short answer: She doesn’t — she can’t. She can only imagine and infer, which, my friends, is FICTION when put in writing. Eliza Hamilton is perhaps the most intriguing woman of 18th century America. She deserves better than this breathlessly written, overwrought soap opera on paper, whose only reason (let’s be honest) for existence is the resurgence of interest in Alexander Hamilton thanks to the brilliant Lin-Manuel Miranda — who just happens to be mentioned in the book sleeve synopsis. Coinkydink? I think not. Good Lord. Ron Chernow has nothing to fear from Tilar Mazzeo. Pass on this, and hope that someday a bona fide historian — or anyone who knows what he or she is doing — writes a credible book that objectively examines the life of this fascinating woman. I enjoyed this book, but it read as much like a fictionalized account of someone's life as an actual biography, maybe more so. There were many scenes in which Eliza's (and Alexander's) inner thoughts or physical reactions, like blushing or calmly sighing, were stated as fact-- though they couldn't have been known. The author used a lot of mixed language when talking about enslaved people, some of which does justice to the lives those people were living against their will, but much of which conti I enjoyed this book, but it read as much like a fictionalized account of someone's life as an actual biography, maybe more so. There were many scenes in which Eliza's (and Alexander's) inner thoughts or physical reactions, like blushing or calmly sighing, were stated as fact-- though they couldn't have been known. The author used a lot of mixed language when talking about enslaved people, some of which does justice to the lives those people were living against their will, but much of which continues to white-wash that part of our history. I expect more out of a book written in 2018. I'm also incredibly disappointed with how little of this book (the last ~50 pages) was dedicated to the 50+ years that Eliza lived after Alexander Hamilton died. She lived far more of her life without him than with him, and she did some pretty incredible things during that time. The author used research which she then fleshed out into the story of Eliza Hamilton's life. The beginning of the book was about her childhood and then about a third of the way through the book, the scandals started. If you like books about the ways of the world in those days with the balls and the limited opportunities for women, you will enjoy this book. If you liked the musical, then you may be interested in this. I'm not a fan of reading most historical tales, whether fiction or non or of rea The author used research which she then fleshed out into the story of Eliza Hamilton's life. The beginning of the book was about her childhood and then about a third of the way through the book, the scandals started. If you like books about the ways of the world in those days with the balls and the limited opportunities for women, you will enjoy this book. If you liked the musical, then you may be interested in this. I'm not a fan of reading most historical tales, whether fiction or non or of reading stories set in this era. It was good for what it was and my rating is based on my interests. A well-written account of the turbulent life of Eliza Hamilton, who damn well deserves her own musical for everything she had to go through. "best of wives and best of women", as Alexander would say. A must-read for every fan of the Hamilton musical. But beware: although classified as a biography, this book reads more like historical fiction. Take it with a grain of salt. Shoddy research, questionable sources, fictionalized passages, and numerous claims without proof/sources. I can’t finish this book because the author clearly isn’t trustworthy. This is highly disappointing. Eliza deserves better. I hope somewhere there is a scholar writing a better biography of her remarkable life, because I eagerly await being able to read it. Could not muscle past the first chapter. Tilar Mazzeo whips out a virtual daytime TV soap opera script that is unreadable to anyone looking for history. An obvious capitalization on the success of the musical, I enjoyed consulting Wikipedia for fact checking more than plowing through this sing-song screenplay like work. Tip: next time you are in Manhattan, visit Alexander and Eliza's home on 414 W 141st St. I was there recently on gray winter day. With just the tour guide as company, I easily en Could not muscle past the first chapter. Tilar Mazzeo whips out a virtual daytime TV soap opera script that is unreadable to anyone looking for history. I've been so curious about Eliza's story and this is an amazing biography of her. Excellent book, that is as much concerned with the details of being alive at that time, as with the historical events. Author's Notes at the end are very good. Written like a novel. Not much discussion of her sources or how she comes to her conclusions, which is important when writing about someone who famously is missing documents. This is fiction - not a biography. The author even wrote the birth years incorrectly on the family tree for Eliza and Anjelica. Do not read. Stick with Chernow. I take a lot of issues with this book. The biggest issue I have with this book is that the author couldn't seem to decide if it's a biography or historical fiction. A lot of the assumptions about Eliza's feelings didn't seem to be founded on anything. She also didn't seem to do any research because some information I could dispute with a quick google search and everything that she cited were all letters and nothing else. The author can write, I'll give her that but it shouldn't be classified as I take a lot of issues with this book. The biggest issue I have with this book is that the author couldn't seem to decide if it's a biography or historical fiction. A lot of the assumptions about Eliza's feelings didn't seem to be founded on anything. She also didn't seem to do any research because some information I could dispute with a quick google search and everything that she cited were all letters and nothing else. I recognize that the book I read is an advanced reader's copy, but it seems to me a fair amount of editing still needs to be done. I found countless mistakes, errors in the genealogical chart at the front of the book, and got a sense that the last chapters had been thrown together too quickly. Hopefully this will be resolved before the first edition hits the stands. There is much about Mazzeo's book to like. She obviously has delved into all the sources she could find, particularly in regards to the Maria Reynolds scandal. Her portrayal of the Schuyler sisters felt especially dynamic; I really got to know these girls, as well as the rest of the family. I would have liked more on Alexander's background (I realize that Eliza is the focus of this book, but we got almost nothing on Alexander before he met his wife). I had no idea that Eliza lived more than half her life AFTER Alexander's death in that famous duel with Aaron Burr. I was impressed to learn of her charitable works and the tenacious way she fought to have her husband's legacy preserved. While informative, and I did learn several things I didn't already know, many of the sources for information on several things were rather questionable, and I struggled through the writing style immensely. A book on a historical figure I adore I expected to take me three, maybe four days to read, and it took me the better part of a month. I do commend Mazzeo for taking on the "first full-length biography of Eliza Hamilton."